Today Mascot Week bring us to a personal highlight from last year. It was a one time mascot appearance, but it left a big impact! 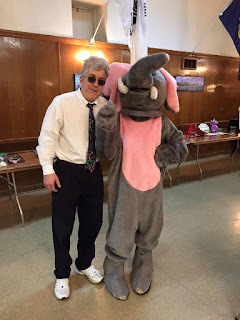 Late in 2015 wrestling manager (and good friend) PL Myers asked me to help him organize and run a benefit show for his daughter's school trip to an elephant sanctuary in Africa. Of course, I agreed. It turned into a great experience on so many levels. I learned a lot about putting together a show. I met a lot of great people. I had a lot of fun. Perhaps the best part was spending time with PL and his wife Lori. They are genuinely two of the nicest people and I was so happy to help them. The show turned out great, raising about $1500. There were several fun wrestling matches and one surprise appearance. As much as we would have liked a real elephant to be at the show, logistics made that impossible. We got the next best thing (or possibly an even better thing) and I had the pleasure of walking the elephant to the rings for her appearance. Yes, it was a female elephant. In fact, (spoiler alert), it was Lori Myers. She had such fun doing it and it really surprised her daughter. It was a great way to end the show. The "Elephant" and me in Summit, IL-February 2016. Looking good .... love the Mascot week! !